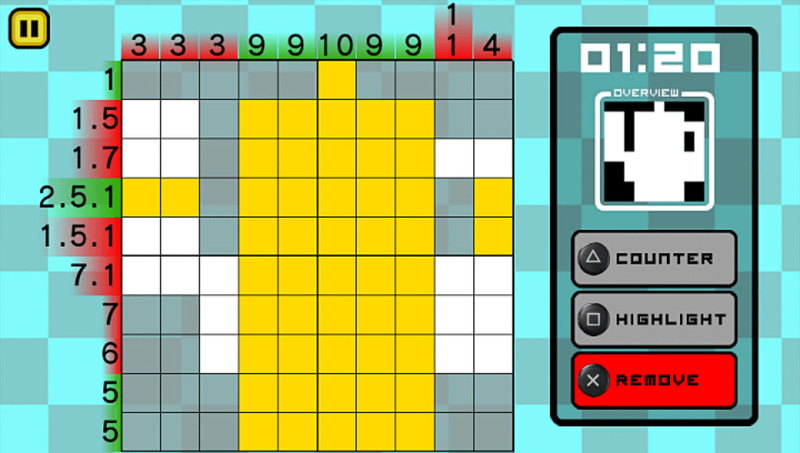 Whether your calling it Nonogram, Griddlers, Picross or in this case Picbox the game is always the same. You are presented with a grid (in Picbox it’s 5×5, 10×10 and 15×15) and you must fill in certain cells in the grid to create a picture. You do this by using numbers at the top and left sides of the grid as directions. For instance if you have a row of 5 cells with a 5 on the left side of the grid then you know that all of those squares should be filled in. Things get more complicated as you’ll have to factor in multiple numbers as well as deciding how many squares should be left blank. If you listen to the podcast you’ll know that I consider these types of logic puzzles to be the greatest ever made. So how does Picbox hold up? For the most part Picbox is a fine version of these logic puzzles. The game comes with over 80 puzzles to solve and even includes 14 awards that you’ll unlock as you solve puzzles and remove blocks. (Not to mention it comes with quite a few free puzzles to try out before buying.) Now I’ve played a LOT of picross style games. There are endless amounts of versions available on the web, there’s a handful of games available on the 3DS eShop and of course there’s now Picbox on PSM. This is a type of game that I usually will obsess over for a month or so and then I’ll take a break. These are incredibly addicting puzzle games that can really challenge the way that you logistically solve puzzles. Which means it’s also incredibly rewarding when you finally figure out an extra difficult puzzle. This is unfortunately one of my issues with Picbox. This could be that I’ve literally just come off playing some 30+ hours of Picross on the 3DS but I found Picbox to be pretty easy. The game’s stats show me as playing around three hours which isn’t a lot all things considered. Even some of the more difficulty 15×15 puzzles I found myself not really having to stop and think about things very often. 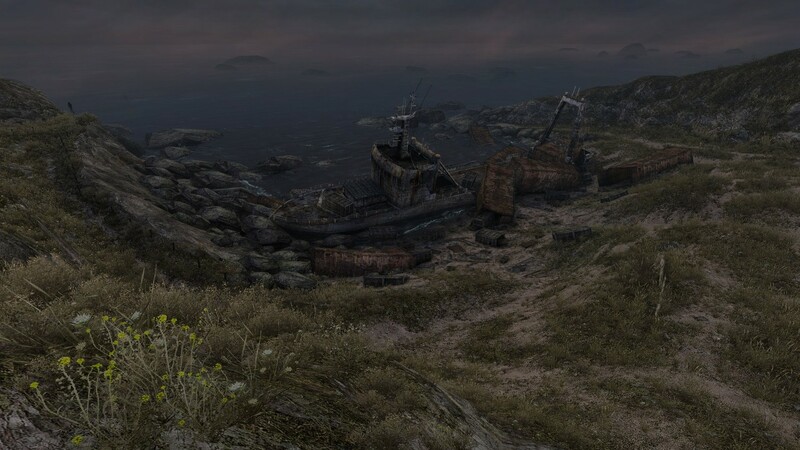 Don’t get me wrong I still absolutely love playing this game but I didn’t quite get the normal amount of enjoyment that I might usually find. Difficulty isn’t really the issue though. The thing that keeps Picbox from being as good as it should be is in its controls. The game allows you to swap on the fly between touch and button controls. Each are fine ways to play but I mostly stuck with buttons purely because I didn’t have the precision needed for the larger puzzles using my fingers. In the game you can count out cells by holding the Triangle button, fill in cells with the Square button or remove them with the Cross button. In Picbox you often work through a process of elimination. If you know for a fact that a specific cell won’t be filled in you can remove it. The thing that annoyed me in Picbox was that the game requires that you remove ALL incorrect cells in order to finish a puzzle. For example even if I have solved the puzzle completely I won’t be able to move on until I’ve removed all the remaining cells. This is even weirder because if I remove all the incorrect cells before solving the puzzle Picbox will automatically fill in the remaining picture for me. So why can’t it do the same for the opposite condition? It also annoyed me that the game uses the Cross button, something normally used to confirm actions, as a way to remove cells. This led to me making numerous unintended mistakes and taking a penalty. I know it sounds like I’m harping on Picbox but please don’t get me wrong. These are the best logic puzzles around and my love for them is right up there with that crazy penguin obsession I have. Picbox is completely fine and still lots of fun. It’s also incredibly inexpensive and worth every penny. The problems I have with the game are extremely minor in the scope of things and won’t take away from your enjoyment. While I do wish there were more difficult puzzles I think it’d be great if Picbox introduced more people to my all time favorite logic puzzle game. Let me put it this way. Ever since I discovered these logic puzzles a few years ago I’ve probably spent close to 100 hours with them. I’ve played through numerous versions and Picbox is just as great. This should be a no brainer. It's my favorite logic puzzle game. Overall a little too easy.